Personalized navy & white 64” arc vented golf umbrellas are largely preferred for brand building because they exude elegance and authoritative charm. 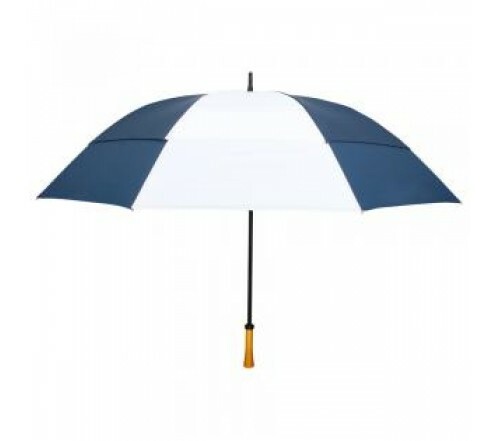 This umbrella features wooden handle, sturdy fiberglass frame, manual open function, windefyer vented canopy, and nylon fabric. 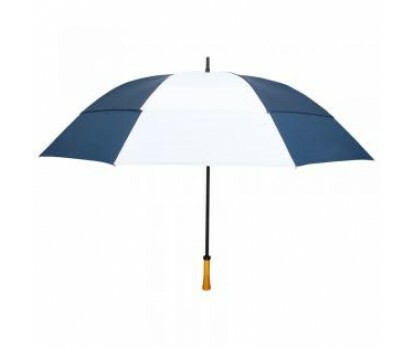 Promotional navy & white 64” arc vented golf umbrellas can be preferred by businesses, which wish to build a royal image of themselves before others. Custom navy & white 64” arc vented golf umbrellas can be sought for corporate gifting in festive seasons or it can be loaned out to staff for exhibition during some niche promotional events. Marketers who are wary of big budget investments can blindly invest in this umbrella because its never going to let them down in performance or popularity. Dimensions - 64" arc - Closes to 42". Imprint area - 10"W x 5"H.